Parents lead their children till they are ready for life on their own. As we cry out to God as our "Abba, Father" (Romans 8:15), God leads us. We are his young children, and we never outgrow our need for his leading. He leads and guides us through the influence and work of the Holy Spirit. This is one reason why Jesus could promise his closest followers that he would not leave them as orphans when he went back to the Father. Instead, he promised to send them the Advocate — the Counselor, the Intercessor, the Comforter, The Helper — whom we know as the Holy Spirit (John 14:16-18). As God's dearly loved children, we can choose to follow the leading of the Holy Spirit, or we can rebel and live on our own. Life and peace, however, are found by living in step with the Spirit's leading (Romans 8:6). Rebellion and death are the results of living on our own without the Father's help (Romans 6:23; Romans 8:6-7). The Father has demonstrated his love for us through the gift of his Son. The Son has promised to be with us through the Holy Spirit. So, let's listen for our Father's voice and follow our Father's heart by responding to the leading of the Holy Spirit! O Father, you are righteous and holy, gracious and merciful. Thank you for claiming me as your child. Thank you for not leaving me alone, left only with my own power, as I try to live for you. 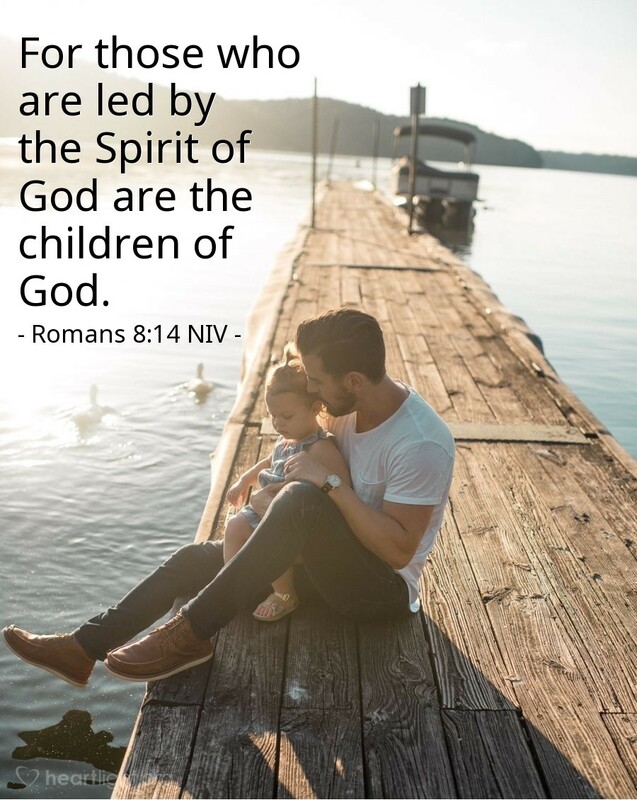 I intentionally submit to the leadership of the Holy Spirit, knowing that the Spirit's presence in my life is a gift from your love to help me live as your beloved child. I thank you, in the name of Jesus my Lord. Amen.